Roxson Contractors (1991) Limited has been in the construction industry for over 35 years. We are proud to have satisfied many of our customers' needs for over three decades. Conveniently located in Cookstown, Ontario, we are one of the most versatile, quality oriented design-build construction companies in Ontario. Roxson provides full service construction featuring Varco-Pruden steel buildings and steel building products. Our well-known pre-engineered steel buildings by Varco-Pruden are always at the leading edge of growing trends and improvements in technology, but it is our consistency in quality of construction services will take the worry out of the project for you. Our expertise in the area of pre-engineered steel buildings is your guarantee that only knowledgeable decisions and options are presented to you. We at Roxson prioritize your needs and wants by constantly staying in touch with your throughout your building project. Your requirements are met by our abilities to handle single, commercial and industrial buildings ranging from 1,000 sq. ft. to 300,000 sq. ft. Roxson will take your initial thought process and produce it into a turn-key building to your ultimate satisfaction. Pre-engineered building erection, retrofit projects, small repairs and services to existing metal buildings are all services we provide efficiently and economically. In other words, we fulfill your building project needs within your budget and time frame. Roxson Contractors are experts who "take the long-term view for you". The solutions we propose will ensure that your satisfaction will last for years. We pride ourselves on always completing our buildings or projects on time and on budget! 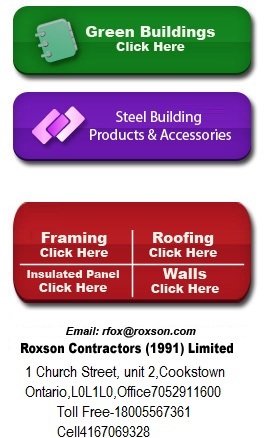 Peruse our website or Call Roxson Contractors today for your free building brochure. We are here to help you obtain your building project goals.